In a first for New South Wales and possibly Australia, new multicultural specific FASD prevention material was launched today in Newcastle. The material was developed by the Hunter Multicultural Community Drug Action Team (CDAT), a group of government and non-government agencies and community members empowering local refugee and multicultural communities to prevent alcohol and drug-related harms. Last year the CDAT identified the hidden epidemic of Fetal Alcohol Spectrum Disorders (FASD) as a key priority area to focus its awareness and prevention activities amongst local refugee and culturally and linguistically diverse (CALD) communities. 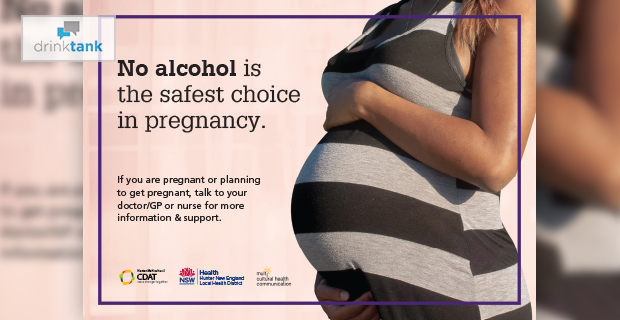 FASD can arise from the consumption of alcohol during pregnancy and there is no safe limit. It’s the most common non-genetic cause of birth defects and a range of permanent physical, intellectual and developmental disabilities that are primarily preventable. 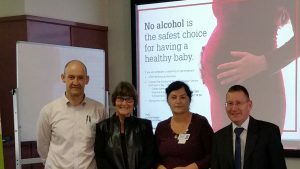 During 2016 in partnership with the Northern Settlement Services and the Hunter New England Drug and Alcohol Services, CDAT members surveyed 142 local adults (mainly women) from 42 different countries to ascertain their level of awareness of FASD and risks from alcohol to the unborn child. From left: Dr Murray Webber, Catherine Norman, Dubravka Vasiljevic and Tony Brown at the launch on Thursday 6 April. The vast majority of those surveyed had a general awareness of the harmful effect of alcohol on babies but little awareness of the magnitude and devastating consequences of FASD. Informed by the survey results and in consultation with NSW Multicultural Health Communication Service, the Hunter Multicultural CDAT developed FASD prevention posters and brochures to help raise awareness of FASD amongst CALD communities as part of a broader parenting engagement strategy. As retiring Foundation Secretary of the Multicultural CDAT Catherine Norman noted “the FASD awareness and prevention material developed in collaboration with our local refugee and other multicultural communities is a shining example of how such positive partnerships can contribute to tackling and preventing critical public health issues such as Fetal Alcohol Spectrum Disorders. Our common goal is to “Make FASD History in Newcastle”. Finally positive steps been taken to prevent FASD which so many people don’t like talking about but I personally know has lifelong devastating effects & yet preventable-thank you… I hope more will follow your lead! Are some alcohol-harm reduction measures discriminatory? 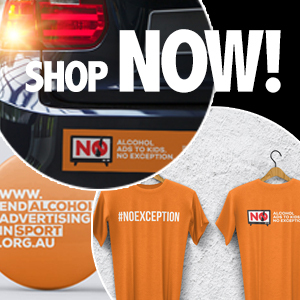 Are NT and Alice Springs alcohol policies racist?